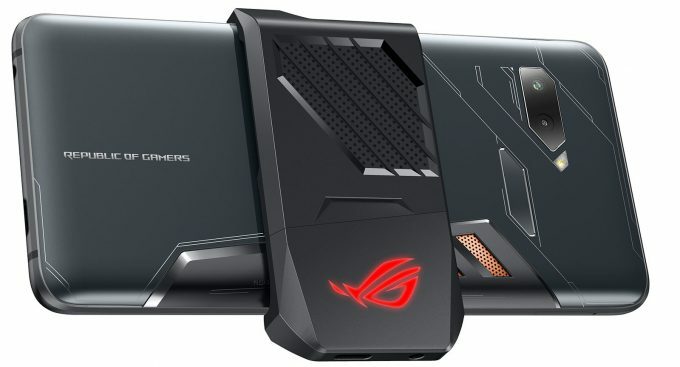 ASUS has released a number of phones over the years, namely its Zenfone range, but here at Computex 2018, its very first smartphone was unveiled under the ROG (Republic of Gamers) branding, meaning this phone is built with gaming at the forefront of its functionality. Taking on the likes of the Razer Phone, the ASUS ROG Phone ticks all the boxes for what should make up the ultimate gaming phone, and we’re not just talking about the highly aggressive looks here. At its core, is a Qualcomm Snapdragon 845 SoC, the current top-end mobile chipset available on the market. However, nearly all flagship phones will have this same chip, so to set itself apart, ASUS had it binned and tuned for an extra 200MHz boost, bringing it up to 2.96GHz. The AMOLED display has HDR support with full DCI-P3 color space, and runs at a rather aggressive 90Hz, rather than the more common 60Hz. This doesn’t quite match the Razer Phone though, as that can hit 120Hz, and has variable refresh, so it can clock things back to save power, something missing from the ROG Phone. The table below will fill you in on most of the important details regarding certain specs, but there are a number of important details to point out, and it’s those details that really set the ROG Phone apart – and not all of them are gimmicky plastic housings to gamify your phone. For the full press release, you can head on over to ASUS’ website. The first thing will seem very simple, but I really do wish this was a lot more common: an extra USB-C port on the side of the phone. This simple addition means you can hold the phone, landscape, without the charging and headphone cables protruding into your hands. To sweeten the deal even more, included in the box is an adapter that has an active cooling fan to keep the phone cool(er), while providing easier access to the charging and headphone sockets. Speaking of charging, the ROG Phone uses some of the more modern charging systems such as integrating the charging IC into the adapter, so the phone won’t get as hot while using the rapid charge function (60% in 33 minutes, 85% in about an hour). Although due to size constraints, it’s still limited to a 4,000mAh battery. On the opposite side corners of the phone, are the AirTriggers, two on the left, 1 on the right. These are ultrasonic triggers that require as little as 20g of force to activate, and can be setup as direct inputs in supported games, or reprogrammed to anything else, including macros. 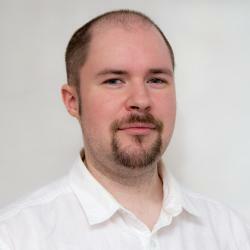 But as with all phones, these need to be supported by the developers to be used natively. There are a couple of interesting peripherals for the ROG Phone as well, that make use of the side USB Type-C port. 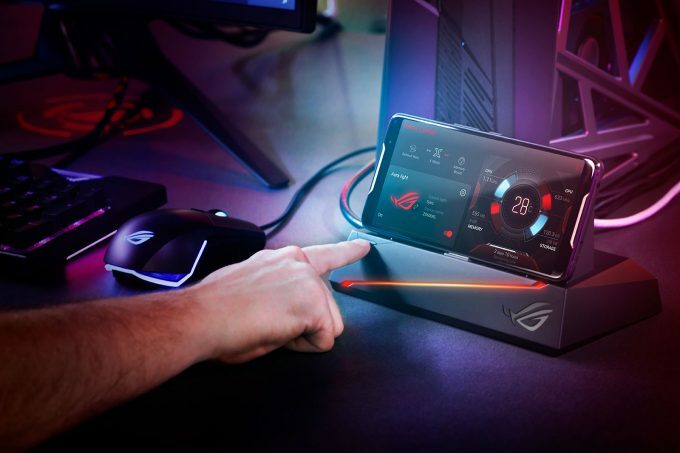 One is a PC dock that lets you hook up a monitor, keyboard, and mouse to the ROG Phone, and use it as a desktop computer (of sorts, Android being the limiting factor). Meaning that when you need to actually do some real work, or enjoy a movie on a big screen, you can. 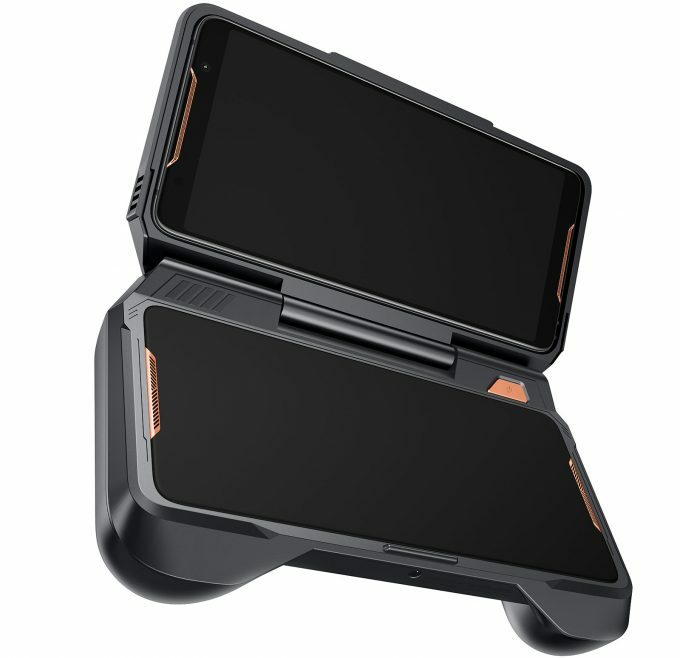 Another interesting addition is a dock with an extra screen, turning the ROG Phone into a semi-clunk Nintendo DS, but with an extra 6,000mAh battery. The display is identical to the one included in the phone, so the screens should look identical. However, another Android limitation means that the second display can only be used for a second viewport for a different application. This isn’t actually bad, since it means you can read guides on one, while you play your game on the main screen. The adapter also has real trigger keys and analog joysticks. In terms of pricing and availability, the only info given is ‘Q3’ launch, with no word on pricing, but don’t expect this to be cheap. The launch price of the Razer Phone was $700, so expect that as a start point, without any of the extras.